Massage Tools: GAIAM, Thera Cane, BackJoy, RAD, Natural Eyes! Thera Cane: This amazingly simple yet effective self-massager makes it easy to apply pain-relieving deep compression directly to hard, knotted "trigger points" anywhere they occur - breaking up tension even in the hardest-to-reach muscles between your shoulder blades! If you have limited strength or mobility, the unique design of the Thera Cane lets you apply deep pressure massage to hard to reach areas of your body on your own. By using the Thera Cane from the three basic positions (standing, sitting and lying down), for one particular point, you are able to access the muscle from the most angles possible. This thorough approach will increase the likelihood of obtaining the proper angle of penetration to relieve the trigger point. Pressure applied to the muscles by the Thera Cane helps to maximize the flow of oxygenated blood to the muscles. This pressure aids in restoring muscle function by breaking up adhesions in muscle fibers and tendons. The increased circulation helps the muscle to work more efficiently. With the Thera Cane you can apply deep pressure massage to the back, neck, shoulders, legs, hips, arms, buttocks, anywhere and everywhere. Thera Cane can be used to reduce muscular pain and discomfort. Recommended by pain management professionals for home therapy. Measures 24" x 15", diameter 1" and weighs 1 lb. ORDER NOW! • BACKJOY SitSmart Relief: SitSmart Relief is a state-of-the-art sitting device that naturally alleviates back pain by improving your sitting posture. Made with a sturdy base material, covered with pressure-relieving foam and a soft fabric covering for all-day comfort. Safe and easy-to-use, it automatically positions your body in correct posture for all-day maximum comfort. Its patented design works by tilting your hips upright to engage core muscles and comfortably "floating" your spine over the seat. Works in any seat—office, car, home, or outdoors. Measures 16" H x 13" W x 4" D. 120-300 lbs. ORDER NOW! • BACKJOY SitSmart Posture Plus: SitSmart Posture Plus is an advanced sitting device that naturally alleviates back pain by improving your sitting posture. Features a comfortable, durable foam on the top that's completely weatherproof for indoor or outdoor use. Safe and easy-to-use, it automatically positions your body in correct posture for all-day comfort. SitSmart Posture Plus works by tilting your hips upright and comfortably "floating" your spine over the seat. Works in any seat—office, car, home, or outdoors. Measures 16" H x 13" W x 4" D.
• BACKJOY SitSmart Posture Plus Black: 120-300 lbs. ORDER NOW! • BACKJOY SitSmart Posture Plus Hot Pink: 120-300 lbs. ORDER NOW! • BACKJOY SitSmart Posture Plus Orange: 120-300 lbs. ORDER NOW! • BACKJOY SitSmart Posture Plus Red: 120-300 lbs. ORDER NOW! • BACKJOY SitSmart Posture Plus Yellow: 120-300 lbs. ORDER NOW! • SIT WITH PERFECT POSTURE EFFORTLESSLY: BackJoy's Patented Orthotic Cradling System was designed solely to relieve pressure and strain on the back. In doing so, it enables you to sit with your core engaged – enabling you to sit for long periods without pain or injury. • DESIGNED TO MOVE WITH YOU AS YOU SIT: BackJoy is designed to work like a personalized orthotic for your unique back. No matter how you sit, it will adapt itself to your position. Whether you naturally slouch, sit up straight, or anything in between – the BackJoy will move with your body to enable more comfort, better posture, and less pain. • POWERFUL RESULTS DELIVERED FROM BACKJOY: It's active and reacts to the way your body moves, while constantly adjusting and allowing your pelvis to move freely which lets your spine go where it wants to go – so you won't hurt. STEP 1: BackJoy "Tilts" To Correct Your Posture: BackJoy automatically corrects your posture. You know you are supposed to sit better but its hard. BackJoy does it for you! STEP 2: BackJoy "Cradles" Your Muscles to Stop Tightening: BackJoy maintains your posture while you sit. Complex science combined with your body weight turns BackJoy into a shock absorber for your spine. It floats your spinal system in a natural cradle of comfort. BackJoy constantly adjusts to your body as you sit to keep unnatural pressures and strains from hurting you. STEP 3: BackJoy "Lifts" Your Pelvis to Eliminate Pressure: BackJoy enganges your core muscles. For the first time when you sit, your core muscles will be engaged. The muscles that are supposed to hold your spine erect can work they way they are supposed to. You feel comfort and will feel refreshed after sitting for hours at a time. Nothing else in the world can do this! Works for all types of conditions. on your back, leading to pain! • BACKJOY SitSmart Pro Gel: SitSmart Pro Gel is made with gel-infused memory foam padding for extra cooling comfort. Ideal for longer sitting at office, home or car. Pro Gel patented design maximizes your posture from the bottom up. Pro Gel helps take the pressure off of your muscles and sit bones wherever you sit so you feel more relaxed, supported, and less tired after sitting for long periods of time. Fits Adults 100-300 lbs ORDER NOW! • BACKJOY ComfortSeat: ComfortSeat is designed to ease muscle tension and reduce the body's natural pressure points to increase sitting comfort. 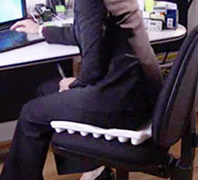 Uses state-of-the-art and patented port + pillar design, so you can be healthier when you sit. -- AIRFLOW: Patented port + pillar design reduces seat surface seat temperatures and relative humidity by providing continuous airflow for maximum comfort. -- WEIGHT DISTRIBUTION: Reduces peak pressures by 70% and evenly distributes body weight to make sitting more comfortable. -- WATER PROOF: Durable, closed-cell EVA won't absorb moisture or generate heat. It even resists heat up to 180 degrees F so it is dishwasher-safe for easy cleaning. -- CORRECT POSTURE: Contoured design relieves pressure on the hips so they remain upright in proper alignment, reducing stress on the lower back. ComfortSeat measures- 15 x 15x 1.5 inches. 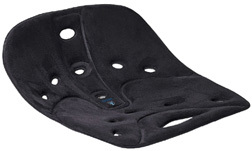 The only seat cushion endorsed by the International Chiropractors Association. ORDER NOW! • BACKJOY Kneeler: BackJoy Kneeler with Dynamic Comfort material provides excellent comfort to your knees offering pressure relief and total comfort on the hardest of surfaces or uneven ground. The ergonomic design shifts the pressure of kneeling into the product to reduce knee pain while stress free acupressure nodes are positioned to take additional strain off the body. Now you can achieve more tasks and delight in doing them while you are in complete comfort. Works great anywhere you have to kneel – garden, bathing baby, DIY, housework and more. Durable, waterproof material for indoor and outdoor use. Measures 16.75 x 8.5 x 1.85 inches and weighs 0.4 lbs. ORDER NOW! • Trigger Point Massager: The Trigger Point Massager is lightweight, sturdy and simple to use. A simple self-massage tool for advanced pain relief. Simply hook the tool over your shoulder or around your body and use the therapy knobs to massage and release tight or achy muscles. Alleviate pain through direct pressure in your back, neck, shoulders, and anywhere else your body holds tension. The exclusive multi-purpose handles offer full control when navigating the device over your body. Therapy knobs provide deep trigger point release. ORDER NOW! 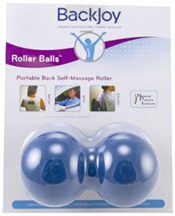 • Roller Balls: The Trigger Point Massager is lightweight, sturdy and simple to use. A simple self-massage tool for advanced pain relief. Simply hook the tool over your shoulder or around your body and use the therapy knobs to massage and release tight or achy muscles. Alleviate pain through direct pressure in your back, neck, shoulders, and anywhere else your body holds tension. The exclusive multi-purpose handles offer full control when navigating the device over your body. Therapy knobs provide deep trigger point release. ORDER NOW! • Posture Band: Wearing the Posture Band promotes good posture and helps to open your chest and remind you to sit and stand tall. Comfortable elastic tension gently pulls the shoulders back to correct posture, reduce strain and feel better throughout the day. The Posture Band is perfect for exercising or for simply wearing around the house. Start each day with your Posture Band, because with great posture you'll feel confident and pain-free. One size fits most. Machine washable. ORDER NOW! 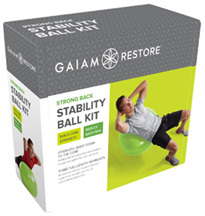 • Restore Strong Back Stability Ball Kit: Strong Back Stability Ball Kit helps build a solid foundation by strengthening the back and core, improving balance and increasing muscle activation. Prominent instructor Suzanne Deason leads three strength-building and stress-relieving practices. -- DAILY STRESS: Release muscle tension with this low-impact daily stretch routine. (15 minutes). -- DAILY WORKOUT: Aimed for beginners yet suitable for all fitness levels, this program helps build muscle and improve posture, coordination and body awareness. (45 minutes). -- SIMPLE STRESS RELIEF: Stay on track and centered throughout the day with these short, yet effective exercises on the Stability Ball. (6 minutes). Kit ncludes 65cm Stability Ball, Air Pump and three downloadable Workouts. ORDER NOW! • Restore Muscle Therapy Foam Roller 18 inch: Muscle Therapy Foam Roller provides a relaxed feeling of a deep tissue massage that gets into muscles to gently release built-up tension, loosen stiffness, and stretching and aligning the spine. Gently massages spine and large muscle groups, increases flexibility and range of motion. Includes Muscle Therapy DVD (15-minute) that teaches you gentle roller exercise routines to help relieve stress and tightness, increase circulation, and self-massage trouble trigger points. Foam Roller measures 18"L x 6" diameter, and weighs 14.6 oz. ORDER NOW! 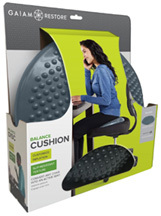 • Restore Balance Cushion: Balance Cushion that will drive you to balance while you sit; triggering constant micro-movements that will fortify your core, improve posture and boost circulation. The exclusive textured surface promotes blood flow and its compact size permits for easy travel, so you can sit energetically anywhere – at home, the office or even on an airplane! Includes Inflation Needle and downloadable Exercise & Inflation Guide. 15 inches Diameter. ORDER NOW! 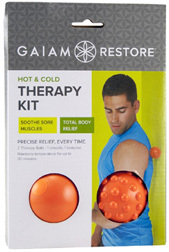 • Restore Hot and Cold Therapy Kit: Restore Hot & Cold Therapy Kit massages muscles to release gentle, controlled tension release to hard-working muscles in the back, shoulders, glutes, and feet. Includes two Therapy Balls, one smooth and one textured, filled with a unique compound that enables them to safely maintain either heat or cold. You control the temperature, motion, and level of pressure for fully customizable therapy. ORDER NOW! 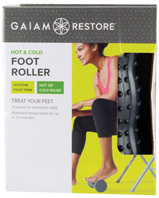 • Restore Hot and Cold Foot Roller: Hot & Cold Foot Roller offers effective relief from pain resulting from plantar fasciitis, heel spurs and everyday aches. The ergonomic shape contours to the arch of the foot while the textured surface provides a kneading effect for increased circulation. Hot/cold technology allows the roller to maintain its temperature for up to 20 minutes of hot or cold therapy. ORDER NOW! 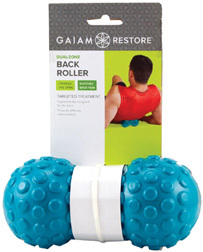 • Restore Dual Zone Back Roller: Dual Zone Back Roller helps reduce muscle soreness and increase circulation. Roll between the ground and your back, along your spine, to massage soreness out of your back muscles. Ergonomically designed for the back. Compact design is travel friendly. ORDER NOW! • Restore Adjustable Massage Roller: Adjustable Massage Roller offers you hundreds of massage options, all in one hand held tool. You can arrange the 12 independently spinning discs anyway you want to target entire muscle groups or focus in a smaller area and get instant benefit. Put the larger discs on opposite ends to treat larger sore areas, put them in the middle for a targeted massage or mix them up for varied relief. Easy attach-and-remove handles. Arrange massage rings in any order. Measures 17 inches long. Includes Adjustable Massage Roller and downloadable Exercise Guide. ORDER NOW! RAD Roller The Everywhere Massage Tool: The RAD Roller is designed to create functional point release all along your spine without putting painful pressure on the spine itself. Rolls lengthwise and across essentially every muscle group in the body, breaking through restrictions in three dimensions as it goes. That is, calves, hip joints, IT bands, glutes, arms, feet, under the shoulder and deep tissue in the neck and back. Athletes, office workers, homebodies, big rig drivers, and everyone in between use the RAD Roller to free up movement in soft tissues and joints every single day. The RAD Roller comfortably fit between the shoulder blades to relieve tension in the back and release movement in the ribcage, which can result in improved breathing. When used regularly, the RAD Roller can create effective, long-lasting outcomes by improving posture and making muscles flexible. • RAD Roller The Everywhere Massage Tool Regular/Original: The texture is soft enough to use on your neck, yet hard enough to unlock tougher muscles like your back, legs and everywhere else you're ready to roll. Natural rubber and color Blue. Measures 6.5" x 2.5" and weighs 13 oz. ORDER NOW! • RAD Roller The Everywhere Massage Tool Soft: Provides a more gentle touch, making it ideal for newbies. It's slightly "cushier" texture also makes it perfect for massaging your neck, scalp and more delicate areas of the body. Natural rubber and color Green. Measures 6.5" x 2.5" and weighs 14 oz. ORDER NOW! • RAD Roller The Everywhere Massage Tool Stiff: Perfect for athletes and others looking for a little more intensity, the Stiff RAD Roller has a harder texture and bends less in the middle so you can turn it sideways and work areas like your pectorals (chest) and inner leg. Natural rubber and color Black. Measures 6.5" x 2.5" and weighs 14 oz. ORDER NOW! • RAD Rounds: RAD Rounds have the small size and pinpoint accuracy to activate muscles that other tools can't touch. With two sizes and two different densities, these balls provide endless options when it comes to tackling your tough spots. Includes one large and one small Silicon RAD Round. Measures Large round 2.2" diameter, small round 1.6" diameter and weighs Large round 3.6 oz. ; small round 1.6 oz. Large round Green, small round Blue.. ORDER NOW! • Relief in Motion RAD Helix: The Only Roller Inspired by DNA. The RAD Helix flushes out toxins, improves your back's range of motion and open posture with its anatomical shape that's designed to protect the spine. Arched design RAD Helix duplicates a double helix, the building blocks of the body. RAD Helix provides a low back extension and three-dimensional muscular release. Made with High-density foam, measures 12.5" x 3" and weighs 1lb. Gray. ORDER NOW! • Relief in Motion RAD Rod: Straight-Up Pressure & Control. The RAD Rod has a slim design decreases surface area so you can fine-tune your pressure without pain. RAD Rod delivers tight muscles and helps release built-up toxins for maximum relief. 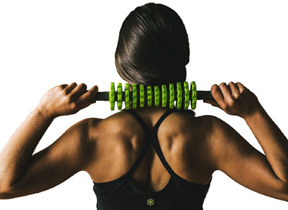 A thin, portable myofascial release tool provides tailor your level of pressure. Made with Steel core, soft EVA foam and silicon; measures 12.25" x 0.75" and weighs 1lb. 2 oz. Gray and Blue. ORDER NOW! • Bongers Massage Tool: BONGERS are traditional massage tools all over the Orient. Theyre good for breaking down muscle tension and stimulating circulation. Most everyone stores tension in their neck and shoulders, and BONGERS are just about always effective there. However, they feel good all over (but dont hit the kidneys! see diagram), giving an invigorating, Shiatsu like massage. Their flexible shafts do all the work, allowing the masseur/se to BONG indefinitely without effort. Pain-Relief: Whether its the lower back, upper shoulders, arms or legs where you are looking for pain-relief Bongers™ can help. Other issues that can be tackled with Bongers™ are carpal tunnel syndrome, cramps, and pain caused by pregnancy and flat feet. Relaxation and Stress-Relief: By relaxing after a long day with a Bonger™ massage you can set your stress levels back to zero and approach those daily challenges with a fresh perspective. Circulation: Bongers™ effectively stimulate blood flow, which can help revitalize low-energy caused by depression or hangovers, destroy cellulite, and break up congestion from pneumonia, bronchitis and chest colds. By improving your circulation with Bongers™ you can also ward off the numerous disorders related to poor circulation as well as helping counteract the effects of aging. Proprioception: Bongers™ can also act as a wonderful proprioception tool while strengthening your wrists, arms, and shoulders. If you stare at the ball while wobbling the ball or massaging it helps train your brain to pinpoint where your hand is located in space; thus improving proprioception. This helps with hand-eye coordination and is extremely useful during recovery from stroke, Muscular Dystrophy, dementia, or Parkinson's. As a result of all these benefits Bongers™ help to promote a positive attitude, deep sleep, good health, personal growth, and improved communication and friendships. Not to mention Bongers™ are portable, human-powered and battery-free, inexpensive, reusable, fun, and easy to use! Length 11.5" and weighs 1 lb. ORDER NOW! • Wooden Back Massager: Wooden Back Massager helps relax and energize, revive tired muscles and relieve stress. Beads are on rope with handles. Use as you would any rope type beaded wooden back massager. #620. ORDER TODAY! • Double Footsie: A reflexology tool for pressure points --- massages and soothes feet, stimulates circulation. Soles of the feet have the most concentration of nerves in the body. Relieve tension. Relax foot muscles and revitalize the body. Each piece is hand-dipped in pure oil and beeswax. Give your feet a treat. ORDER TODAY! • Maxie Backsie Flex: Maxi Backsie Flex Massage Tool delivers a comfortable, deep penetrating massage of the spinal column. The new rubber rings stabilize the rolling action making it easier to control your movements. By giving a gentle stretch to the spine and a deep massage to the antigravity muscles in the back, the Maxi Backsie stimulates three fundamental lines of energy known to every ancient culture around the world. Made of Natural Wood. ORDER TODAY! • "Footsie" Foot Massager: Carry this portable foot massager any where and any time to soothe the feet and invigorate the mind. To use, place the roller under the foot. Roll back and forth from heel to toe. 9" x 2". ORDER TODAY. • Chi Balance Massager: Tensed? Chi Balance Massager helps invigorate circulation and relieves stress and tiredness by restoring stability to the body and mind. This massager can be used by itself; but for best results use in combination with Anti-Stress massage oil or lotion. ORDER TODAY. • Pin Hole Glasses (Vision Training Kit): Many people have experienced amazing improvements in their vision by wearing the Natural Eyes Vision Glasses and following the exercises in the manual provided with the kit. Wearing these glasses exercises the muscles in the eyes, thereby changing the shape of the eyes to improve vision. The eyes easily adapt to the pinhole design and there is immediate improvement in eye strain. Wearing the glassesss for a few minutes each day may bring significant results. A safe , relaxing and completely natural vision training technique. Takes only minutes a day. The kit contains Natural Eyes vision training glasses & exercise manual. ORDER TODAY! • Kid's Pin Hole Glasses (Vision Training Kit): Many people have experienced amazing improvements in their vision by wearing the Natural Eyes Vision Glasses and following the exercises in the manual provided with the kit. Wearing these glasses exercises the muscles in the eyes, thereby changing the shape of the eyes to improve vision. The eyes easily adapt to the pinhole design and there is immediate improvement in eye strain. Wearing the glassesss for a few minutes each day may bring significant results. A safe , relaxing and completely natural vision training technique. Takes only minutes a day. The kit contains Natural Eyes vision training glasses & exercise manual. ORDER TODAY! • Knobble Massage Tool: The Knobble gives your hands more power when they need it. Use the tip, base or side to apply deep pressure massage to sore muscles and trigger points. You may lie on the Knobble using padding such as a folded towel for a softer pressure. 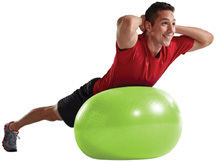 You may also lean into the Knobble while seated to do your own back, hips, hamstrings or feet. The Knobble massage tool is designed to reduce Repetitive Stress Injury (RSI) to the forearms, wrists, hands, fingers and thumbs while applying deep or prolonged pressure to muscle knots or taught bands of contracted muscle tissue. Applying steady pressure to tense, contracted muscle helps them to "release" and relax. Begin gently and slowly increase the pressure at a rate that feels good to you or the person you are working on. Remember to position yourself in such a way that you use your weight, not just your strength, to apply pressure to the muscle. You'll soon find the positions and grips that do the most work with the least effort. The Knobble can help you help yourself to a good massage anytime, anywhere. CAUTION: Avoid direct pressure against the spine, other bones, large blood vessels or areas that have been recently injured or are inflamed. Consult a health professional for any doubtful or serious conditions. ORDER TODAY! • Knobble II Massage Tool: The secret of good deep pressure massage is the gradual application of pressure. As you use your Knobble to explore an area that needs attention, you may find a tense knot or strand of contracted muscle that feels like the core of the ache. Hold the pressure steady at a level that feels okay to you; don't force it. As the tense tissues get used to the pressure and begin to let go, you can gradually increase the pressure. Some gentle kneading motion with the Knobble or slow movement of the part of the body being massaged may be helpful. When you feel you've had enough, release the pressure and move on to another area. For a softer massage use padding, such as a folded towel. Let gravity do the work. Knobble is made of plastic and rubber. The Knobble II gives your hand more power when you need it. Use either the tip or the base for applying pressure on yourself or others. The Knobble II doesn't replace your healing hands- it just helps them do more and last longer. Made of durable polymer with a band of non-latex, Santoprene. Assorted colors. • Knobble II Massage Tool: Amethyst Purple. ORDER NOW! • Knobble II Massage Tool: Emerald Green. ORDER NOW! • Knobble II Massage Tool: Sapphire Blue. ORDER NOW! The Original Backnobber®: The Original Backnobber is hand crafted from a steel bar, bent in the shape of an “S” with wooden balls, one relatively small and one somewhat larger, permanently affixed to each end. The tool is used by hooking the device over a shoulder or under an arm and using its leverage to apply direct, deep, steady pressure to trigger points in the muscles of the neck, shoulders and upper and lower back or any large or small muscle in the body where a trigger point might occur. This pressure followed by careful, regular stretching and strengthening excercises can, over time, significantly reduce muscle tension. 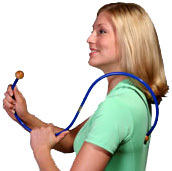 • The Original Backnobber® (Regular Size): The Original Backnobber® (Regular Size), the first of its kind, has been a classic favorite of professional, hands on therapists for over twenty years. 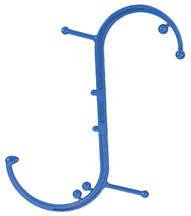 The Regular size Backnobber measures approximately 19 inches in overall length with curves 9 inches across each curve. This size is used comfortably by most adults for over the shoulder, deep muscle compression in the neck and upper back areas and under an arm for middle and lower back areas. Measures 19.0 " W x 9.0 " H x 1.0 " D; weighs 1.00 lbs. Cobalt Blue. ORDER TODAY! • The Original Backnobber® (Long Size): The Original Backnobber® (Long Size) curves are the same diameter as the The Original Regular Backnobber®, and it can be used effectively by most people. However, its extra length makes it more comfortable for people who are taller than six feet. Measures 29.0 " W x 9.0 " H x 1.0 " D; weighs 1.00 lbs. Cobalt Blue. ORDER TODAY! • Tiger Tail Rolling Muscle Massager: Make your muscles happy! The Tiger Tail Rolling Muscle Massager, 18" is a dense foam covered, muscle-friendly self care massage tool that helps you apply rolling and compression massage techniques. The Tiger Tail reinvigorates tired muscles and prepares them for exercise. Great for the neck, shoulders, arms, upper/lower back, glutes, IT band, thighs, hamstrings, quads, calves and feet! Recommended and used by professional athletes, sports trainers, massage & physical therapists, chiropractors and doctors. 18" Measures 1.5 " W x 1.5 " H x 18.0 " D; 2.00 lbs. Made in USA. ORDER TODAY!